Tickets to this evening with Partners in Time and Souren Baronian are $30 general, $25 for HPR members, and $15 for students with ID. Reservations may be made at www.hprtickets.org or by calling the station (955-8821) during regular business hours. The Atherton Studio is located at Hawaiʻi Public Radio, 738 Kāheka Street. Doors open at 7:00 p.m. and the concert begins at 7:30 p.m. The music of Partners in Time is drawn primarily from Bulgaria, Macedonia, Greece, Armenia, and Turkey. 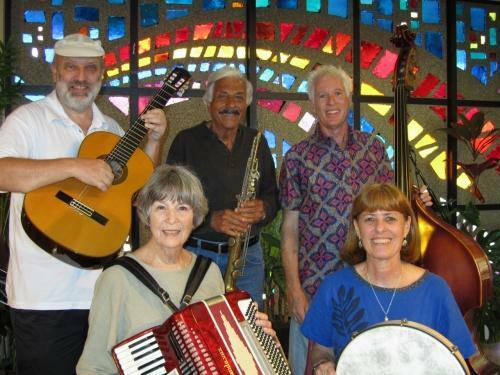 Band members are Kip McAtee (guitar), Anita Trubitt (accordion), Ernie Provencher (bass), and Marcia Kemble (dumbek, or hand drum, and frame drum). Baronian adds the G clarinet, soprano saxophone, kaval (flute), dudook (double-reed instrument), dumbek, and tambourine. Many of the pieces they perform together include improvisation, a practice common to both Balkan/Middle Eastern music and jazz. Much of the original material featured on the program is composed by Baronian. Souren Baronian's playing and compositions are a true synthesis of jazz and authentic Near/Middle Eastern music. In his youth, he trained with the renowned Turkish master Safet Gundeger, as well as the legendary jazz musician Lennie Tristano. He has toured and recorded over the years with numerous well-known ethnic and jazz musicians and he performs regularly throughout the U.S. and Europe with his bands Transition and Taksim. Baronian is based in New York, but has been coming to Hawaiʻi annually for many years. Kip McAtee has played jazz and blues guitar professionally for many years. He was a member of the Sahara Hotel Orchestra in Las Vegas and also performed with blues singer Rufus Thomas and the R & B group Cornelius Brothers and Sister Rose. McAtee discovered and began playing Balkan music in the mid-1980s. He played with several Balkan bands on the mainland and has taught Bulgarian tambura at the Balkan Music & Dance Camp in Mendocino, California. McAtee composed some of the original tunes performed by the band. Anita Trubitt, who was trained in classical piano and has a master's degree in music, had been an international folk dancer for many years when she took up the accordion in the early 1980s so that she could help form a fledgling band to provide live music for the local recreational folk dance group. They were called the Pleasant Peasant Band until 1998, when they adopted their present name, Partners in Time. The band's membership has evolved over the years, and Trubitt is the only member of the current band who has been with the group since its inception. Ernie Provencher is a versatile and accomplished bassist. He has been active in many musical environments in New York City, Hong Kong, Europe, and Honolulu. His compositions for modern dance have been presented worldwide and he has played on numerous recordings and concert stages including the Berlin Jazz Festival, the Taipei Jazz Festival, The Fairbanks Summer Arts Festival, and the Santa Cruz New Music Festival. He received his master's degree in music and double bass performance at the University of Hawaiʻi at Mānoa and teaches band and orchestra in local private schools. His interest in Balkan music began when he moved to Honolulu in 1995 and met the members of Partners in Time. Marcia Kemble, who plays dumbek (hand drum), tupan (bass drum), and frame drum, began studying and playing Balkan music as an outgrowth of her interest in Balkan folk dance. She was a member for many years of the Omega Dancers, a local Balkan and Eastern European folk dance performing group, and has been studying and playing Balkan percussion since the early 1980s.